We’ve made it back to Monday! I hope you had a good weekend; mine was good, and busy. Friday evening and Saturday were spent with groups of wonderful ladies, with everyone making 8 all occasion cards – hence the ‘Something for Everyone’ title! 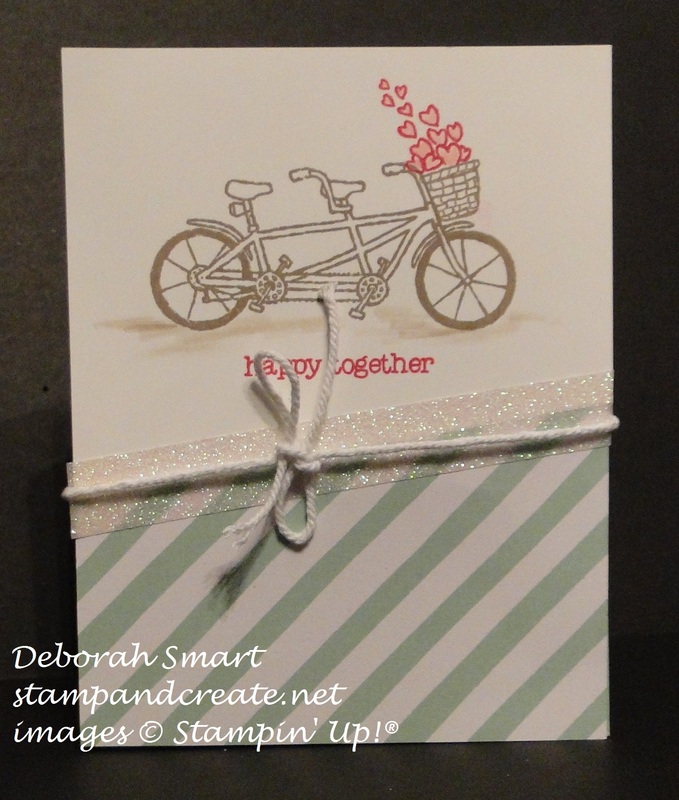 To start with we have this cute Anniversary card made using the new Sale-A-Bration set Pedal Pusher. You’ll be able to get this set for FREE starting tomorrow, Feb. 16th. This is my version of the card shown in the new SAB flyer. The top part of the card is Whisper White, cut on an angle at the bottom. On it, I stamped the bicycle in Tip Top Taupe, then stamped the basket on the front. I then added the hearts, stamped in Melon Mambo ink. I wanted to colour the hearts, but keep them sharply outlined, so I used my Pink Pirouette Stampin’ Write Marker to colour them in. To create the shadow under the bicycle, I used my Blender Pen, and picked up some Tip Top Taupe ink and lightly created the shadow. The sentiment was then stamped in Melon Mambo ink. To put the card together, I used Tombow glue to attach the top to the bottom striped paper from the It’s My Party DSP stack. I then placed a strip of the new Metallics Glitter Tape across the join, then tied White Baker’s Twine on top of that. I then attached this to the card base, made of Whisper White cardstock. For the inside, I used the Happy Anniversary sentiment from the Number of Years stamp set, and added the same hearts in the bottom right corner. The next card is made using the wonderful Botanical Blooms Bundle – the stamp set, the Botanical Gardens DSP and the Botanical Builder Framelits Dies. This is such a great value deal for a bundle!! I started with a regular card base of Whisper White cardstock, then used the leaf edgelit to cut the front panel. This let me add the panel of DSP to the inside of the card, yet it still shows off the wonderful panel to the front. I used the Framelits to die cut the 2 leaves and the 2 flowers, plus the ‘stamen’. 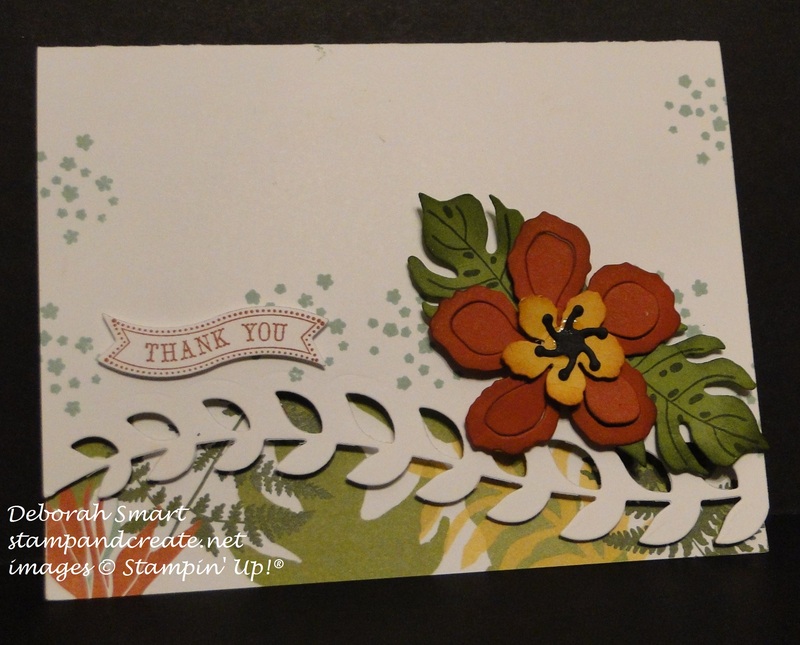 I used Cajun Craze cardstock for the large flower, Crushed Curry for the smaller one, and Basic Black for the stamen. I used a Sponge Dauber and Cajun Craze ink to sponge around the edges of the two flowers. For the leaves, I die cut them from Old Olive cardstock, stamped the veins in Mossy Meadow ink, then used a Sponge Dauber and Old Olive ink to sponge the edges of the leaves. I stamped the small flower clusters in Mint Macaron ink onto the card front, then attached the die cut flowers & leaves using Stampin’ Dimensionals. The sentiment is from the Itty Bitty Banners set, stamped in Cajun Craze and die cut using the Bitty Banners Framelits; then attached using Dimensionals. Remember that today is your last chance to get the Sky is the Limit and Hello stamp sets and the Perfectly Artistic DSP from the Sale-A-Bration brochure!! You have until 11 pm MT (10 pm PST) to get your order in to earn these items. Tomorrow, you’ll be able to choose from the remainder of the Sale-A-Bration brochure, plus the 3 new items – the Party Pants and Pedal Pusher stamp sets, and the Metallics Glitter Tape. If you want them all, you have until the end of Sale-A-Bration – March 31st – to earn them for FREE! Remember, every $60 order qualifies you for 1 FREE SAB item. You can place your order directly online HERE, or contact me directly debsmart@shaw.ca and I’ll be happy to place your order for you. Previous Previous post: Sneak Peek – New Sale-A-Bration Products!